Sometimes you go to the dentist and the assistant places x ray films in your mouth. They may feel a little uncomfortable and seem to push on your gums…these films are called peri-apical x rays. Peri-Apicals are needed in dentistry because they show us if there’s an infection or any other abnormality underneath (for a lower tooth) and above (for an upper tooth) the roots of the teeth. Generally, we take peri-apical x rays once every three to four years, unless an individual comes into the office and it’s an emergency dental situation. In these instances we need to take a peri-apical x ray to assess whether or not there is an infection or any other problem with the tooth. 1) Diabetic individuals are more prone to developing infections in the bony areas that hold the roots of the teeth in (please see blog posted on September 29th, 2012). For this reason, peri-apicals are important as we can easily see any infections that may be present. 2) Peri-Apicals are also used to detect extra teeth (known as Hyperdontia) that are present. These are called supernumary teeth. 3) In addition, peri-apicals are used to visualize impacted teeth in the jaw. The above image shows a tooth that has had a crown and a root canal. 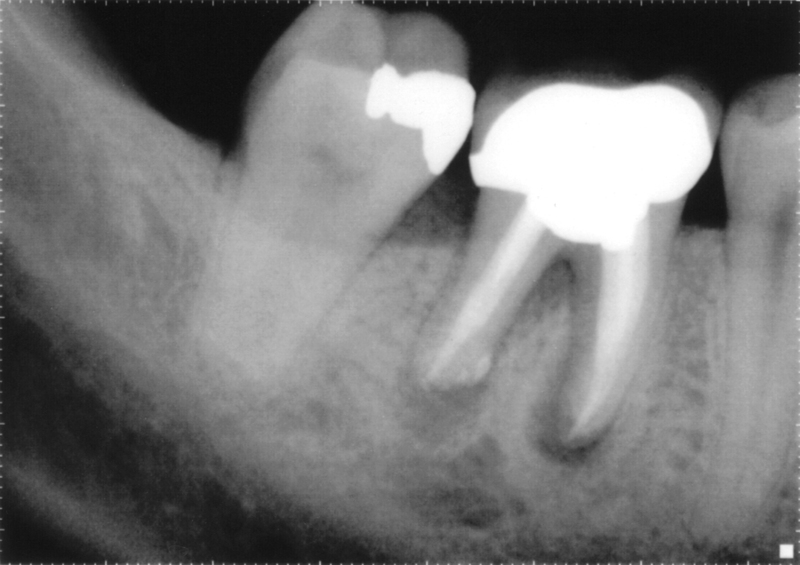 The crown appears as a large white area and the root canal as two vertical white lines. In addition, the x ray shows two dark areas underneath the roots of the teeth. These areas are known as ‘radiolucencies’ and in this case indicate that the root canal has failed. The radiolucency is actually a chronic infection. At times it is possible to save a tooth in this condition by doing a surgical procedure known as an Apicoectomy. This would remove the infection from underneath the roots. However, in many instances, it may not be possible to save a tooth in this state via this surgical procedure and the better option is to extract the tooth. We remove the tooth in question, wait a few months for adequate healing and then place a dental implant. You can learn more about dental implants by reviewing the blog “Dental Implants…A great solution for a missing tooth,” posted on October 9, 2011.